How Corporate and Industrial Visits by College students can change their life. Industrial Visits are some of the various attempts to bridge the Gap between the Industry and the Education System. But, these visits by students are mere ceremonial and don’t provide any tangible benefits to Students. Firstly, not all college students have Industrial visits as compulsory activity. Only few streams and few colleges do that regularly. A vast majority of students are studying in Arts, Commerce and Science colleges, where unfortunately there is no concept of Industrial visits. Which is a serious concern. 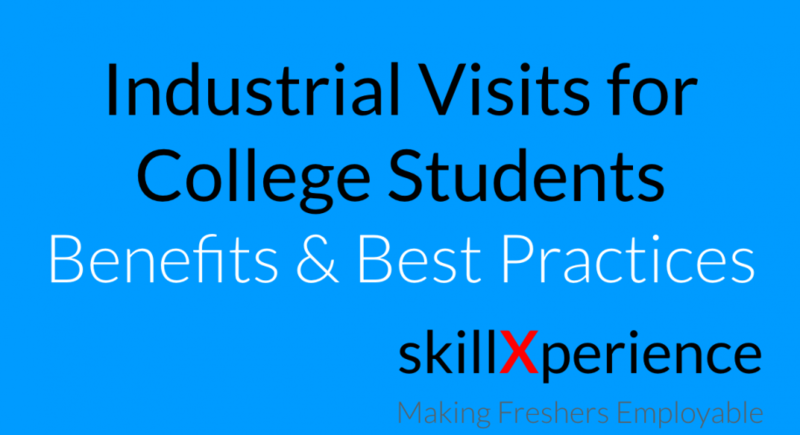 Only Some Engineering and Management colleges have practice of Industrial visits by students. These two are too few to make any considerable impact on life and career of students. Secondly, many times we see that MBA HR students visiting some factory and understanding how boilers and machines work. Which is perhaps not exactly what they are going to do for their life. Instead they should be meeting the HR team and discussing how they function. Further, even the companies where students visit are also not very enthusiastic about the visit. They perhaps don’t have the time and inclination to seriously impart some knowledge to the students, which will be useful for their life & Career. Its just an extra activity, which they want to show in their annual report. Most of the students when they visit the companies don’t know what to expect out of the visit. They just assume it as a picnic and a day out of college, perhaps an official escape from the boring studies. Guidelines and Best Practice for Industrial visit. This needs to be made compulsory for each and every student, irrespective of the stream they belong to. Now, we don’t need a policy change from the education Ministry for this. It can be done at the college level also. Not only compulsory, but the visits should be frequent enough, to allow students to get the feel of the Professional life. There is no point in taking B.Com (or MBA Finance) students and showing them factory. We need to show them how the Accounts and Finance department works. They should know what are responsibilities of the people working there. What are their challenges and duties. If MBA HR students are visiting some company, they should be meeting the HR team and discussing issues pertaining to Hiring, Recruitment, Increment, Culture, Appraisals, Legal compliance etc. Most of the time, Students think that Industrial visit is a No-Study day. They need to be explained properly, why these kind of visits are organised. Here are some of the benefits which need to be explained to students thoroughly. Getting to know how their career life is going to look like. Understand the roles, responsibilities and challenges in that professional life. Prepare themselves for that role in their careers. Ask more and more questions and get maximum knowledge. Students need to be briefed what questions to ask. Generally, in the college, students are encouraged to listen and remember. They are not habituated to asking questions. But for the Industrial Visits, they need to ask questions to get the maximum benefit. What does your day look like? What are your daily activities. What are you exactly responsible for. What is your Key Responsibility. What are the challenges that you generally face in your professional life. How do you manage or tackle them. How do you mange your relationship with your seniors, colleagues and Juniors? What kind of equipment or technology you use? The link of LinkedIn profiles of Promoters and key persons. What knowledge students can gain from this visit. What questions they should ask to employees of that company. A small session should be conducted with students. Students should be required to share at least 6 points that they observed during the visit. This entire exercise will give the maximum benefit to the students. Coordination with the company which is being visited. When visit is being organised, make sure that few of their key persons are available to spend some time with the students. They should be ready and willing to share knowledge and information with students. It is not only the college students that benefit from these visits. Companies also have a huge benefit. Companies get to attract the best and fresh talent from the local colleges. Do an orientation Session with your students / Professors to set the expectations right. Coordinate with the companies, for the visits. Really a very good attempt and useful guidelines for colleges.It should be made compulsory for all the colleges and faculties. Thanks a lot, Anisha Madam, Please help to spread the word by sharing this. Quizzes and hands-on lab like manuals for industrial visits should help make the visits more interactive. Moreover, follow up by the respective factory/industry would help the students clear any doubts, enhance their understandings about the company they visit. Perhaps, later they can even consider internships to further enhance their knowledge. Yes, That’s the exact point. We are trying to do that only. Please help to spread the word by sharing this. Thanks a lot for your comments, Ajay Dand. Yes, Vivek Anand, you are right. I appreciate the good work that you are doing. Please help to spread the word by sharing this. Thanks for the comments. Can you please also help by sharing this. Definitely students get vision, practical problem solving system, and of course get benefits of the experience of the industrialists in all aspects. Well done Limeshbhai. Thanks a lot, Viren Sheth. Would be obliged if you help to spread the word by sharing this. The exposure to Industry at a formative stage is crucial, as it helps students in mitigation of industry needs and clear their perception about working in an industry. They can channelize their efforts towards a clear goal!!! Very rightly said, Parimal Parmar. Please visit our participate section and register yourself with ideas that you would like to contribute. Very apt approach Limesh. Students are often unprepared for Industrial Visits. Would it make a difference to the student’s approach if they participate in a Strengths Finder exercise at the beginning of the year and the visits be subsequently structured based on the identified strengths. E.g if a student is strong in design, a visit to a R&D will make a better synergy. Yes, Exactly that is the purpose. If students visit companies at a formative stage, they would be able to pick up their interests much earlier and decide their careers in much more detail.